So maybe it's just me, but I didn't realize until just the other day how to easily sew an exposed bias binding. I wish I could say that I came up with it but it was in the instructions for the Colette Sorbetto pattern! I always thought that you sew the right side of the bias tape to the right side of the fabric. 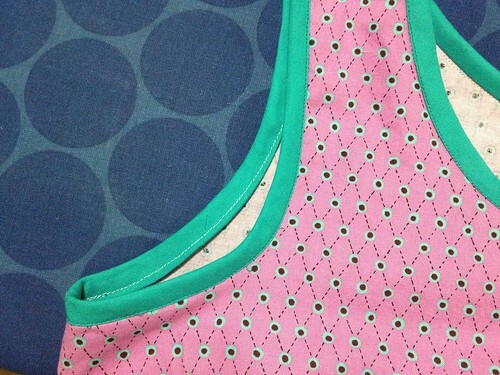 Then fold over the bias and topstitch on the right side while magically catching the backside. Pre-made bias tape is sold where one side is wider just so that it will catch on the backside. However, especially on curved edges it doesn't always catch or I would fold over more of it just to be extra sure that there would be lots of extra tape on the wrong side, which to me was equally as bad and ugly. In other cases I would topstitch with the wrong side up which would not always look pretty on the right side. I would get so frustrated with this... Sometimes I would unpick the stitches and then redo or if it was minor I would just live with it. I wish I had some examples to you of each of these... I may have to go back and look for them. Well, in the Sorbetto instructions you sew the right side of the bias tape to the wrong side of the fabric. Then you fold it over to the right side and topstitch on the right side. 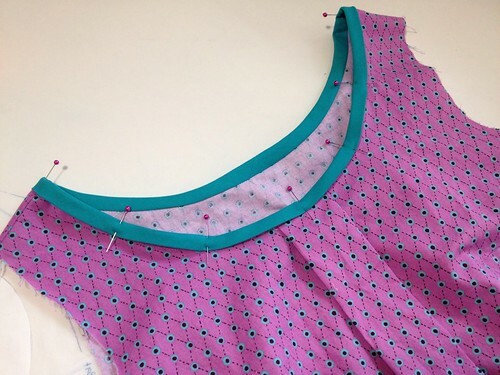 This way you will make sure the bias tape is sewed down properly and neatly. 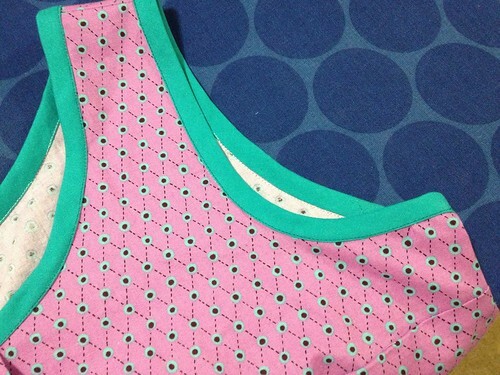 Here is the neckline of my Sorbetto with the bias tape folded over to the front. Tada! The bias tape is fully stitched down. The wrong side didn't always catch, but that's ok because it was sewed down when it was first attached. There are no places where the tape isn't fully sewn to the garment. As a creature of habit, I of course went back to the old method on the first armhole. Just to show you an example, I went back to the old method for one of the armholes. The bias tape is fully caught in the stitching because I was sewing carefully and also folded the bias tape over more than I should just to be sure. You can see the extra bias tape below the stitching line on the wrong side. 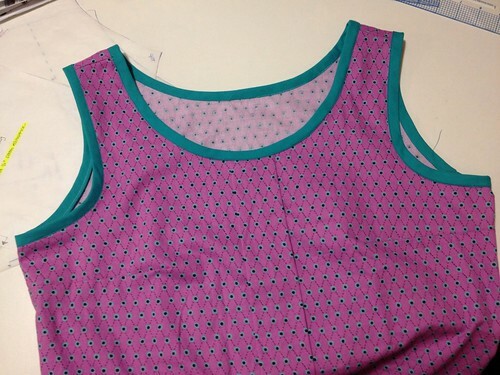 The second armhole was done the Colette method. 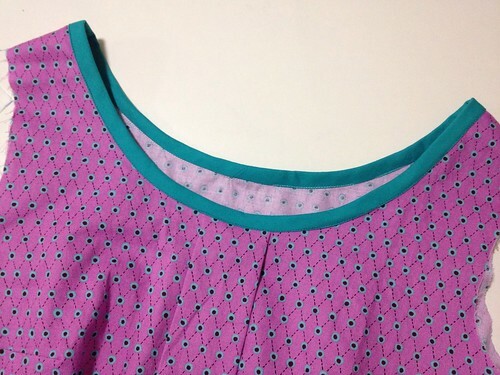 The left armhole (old method) has a slightly smaller width of the bias tape visible on the right side compared to the neckline and right armhole. It's more noticeable in person than the picture. I'm so excited about this and hope that I will remember to use it in the future! Yay! Um, where's the picture of it on? It's looks cute. I think I'm gonna make a sorbetto next. I ran out of tracing paper, so I have to make something I've made before. I think I have found my inspiration! Picture coming soon... :) it goes together quickly so you'll have a top in no time!! this post took me a minute to wrap my head around, and then i get it!!! I have a similar issue with connecting a bodice piece with lining to a skirt piece without lining, and trying to encase all the raw edges. this is a good tip! Hmmm... Interesting. You can do that without hand stitching? I'm going to think a little harder about that one next time I have a lined bodice with no lined skirt. Genius! Thanks for writing about this. Why did this never occur to me before? Love the sorbetto btw. I was thinking the same thing when I was reading the directions! Hehe... We're here to help each other out. ^_^ Thanks! It looks so much better that way, right? I found that to be true, too. It's enough to make a creature of habit change her ways! LOL I haven't made Sorbetto but am about to tackle something in the same camp: the Wiksten tank. Soon. Yes! Hehe... It sure is and create a new habit. Can't wait to see your tank! I agree, this way is far superior...your edgestitching/topstitching on the front side looks awesome, btw!